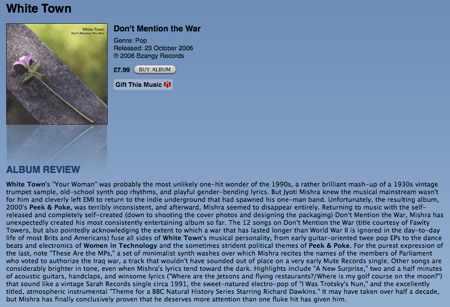 White Town – Don’t Mention The War iTunes Review! Don’t Mention The War iTunes Review! White Town’s “Your Woman” was probably the most unlikely one-hit wonder of the 1990s, a rather brilliant mash-up of a 1930s vintage trumpet sample, old-school synth pop rhythms, and playful gender-bending lyrics. But Jyoti Mishra knew the musical mainstream wasn’t for him and cleverly left EMI to return to the indie underground that had spawned his one-man band. Unfortunately, the resulting album, 2000’s Peek & Poke, was terribly inconsistent, and afterward, Mishra seemed to disappear entirely. Returning to music with the self-released and completely self-created (down to shooting the cover photos and designing the packaging) Don’t Mention the War, Mishra has unexpectedly created his most consistently entertaining album so far. The 12 songs on Don’t Mention the War (title courtesy of Fawlty Towers, but also pointedly acknowledging the extent to which a war that has lasted longer than World War II is ignored in the day-to-day life of most Brits and Americans) fuse all sides of White Town’s musical personality, from early guitar-oriented twee pop EPs to the dance beats and electronics of Women in Technology and the sometimes strident political themes of Peek & Poke. For the purest expression of the last, note “These Are the MPs,” a set of minimalist synth washes over which Mishra recites the names of the members of Parliament who voted to authorize the Iraq war, a track that wouldn’t have sounded out of place on a very early Mute Records single. It may have taken over half a decade, but Mishra has finally conclusively proven that he deserves more attention than one fluke hit has given him. What a lovely review! Thanks, iTunes!